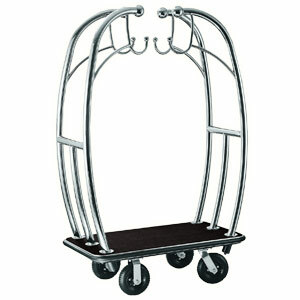 You are looking at the updated model of the CSL Angel Style 2" Tubing Stainless Steel Hotel Cart. Features black plush carpet, solid rubber wheels, and many other improvements. Built in hooks for those garment bags. Luxurious and practical! Its sleek look will be a beautiful addition to any hotel. 48 x 72.5 x 26 in.